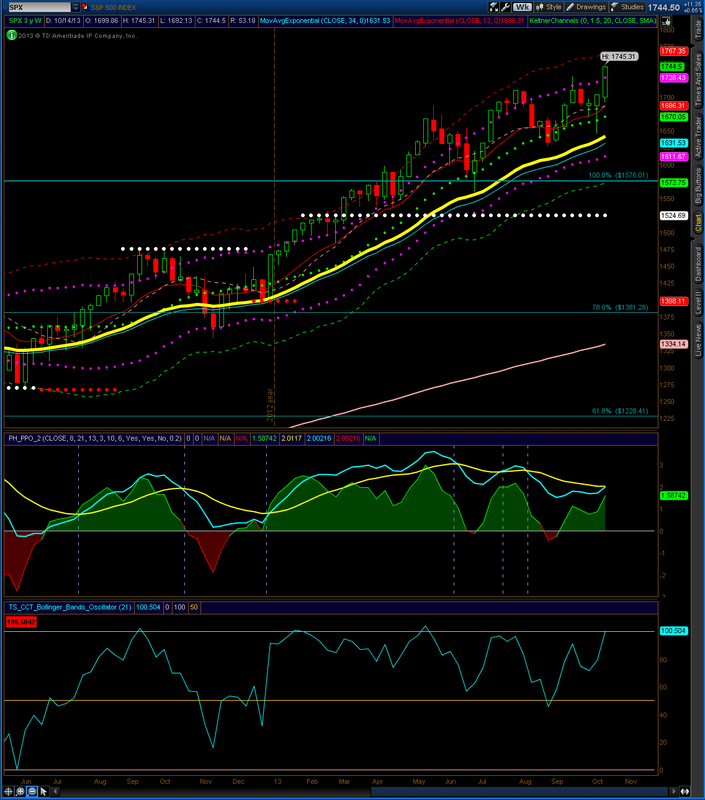 The SP 500 weekly is showing a new high on the chart and a close above the previous Keltner line. Until sustained weakness comes into the market, the weekly outlook remains bullish. 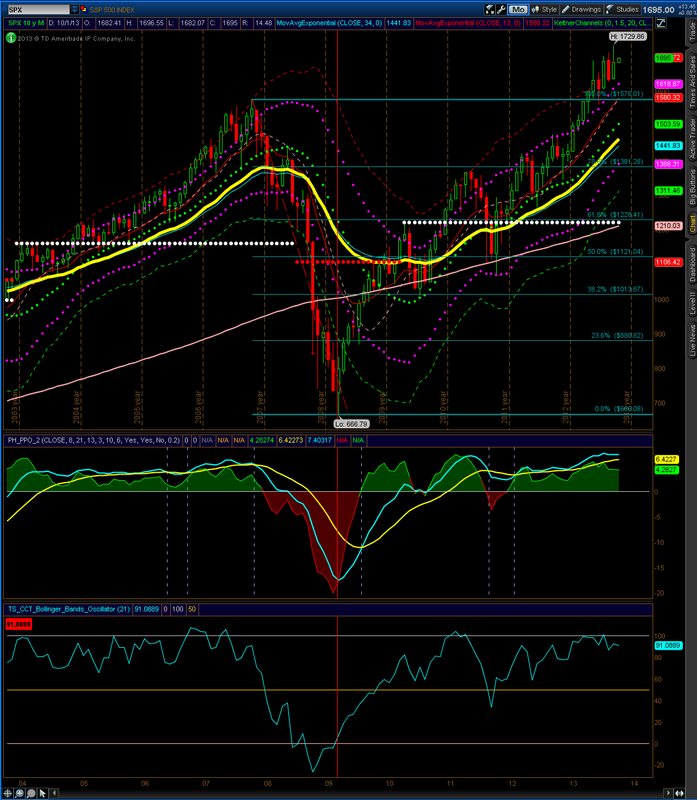 The S&P 500 weekly is showing another close above the upper Keltner line. A rally may test 1767 while a sell off may retest 1728 or lower. The weekly outlook is bullish. The S&P 500 weekly is showing another close in the upper Keltner channel. The reversal from lows near 1650 shows that buyers are still in the market. On a rally, 1722 or higher may be tested, while a sell off should retest 1664 or lower. One detail that’s interesting is the slight divergence on the PPO. This is reflected in the price action where highs are sold into the Keltner average, rather than just the top Keltner line in the previous half of the year. 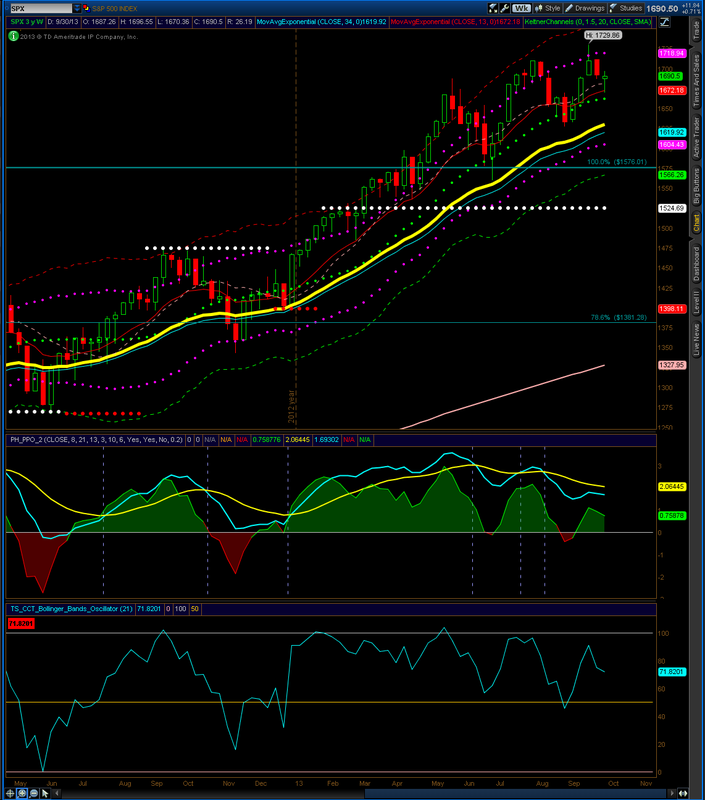 The S&P 500 weekly is showing a close in the upper keltner channel. If the market rallies, I expect 1718 to be tested, while a sell off could retest 1661. My outlook is neutral to bullish. Currently, sentiment seems to be hovering a little heavily bearish due to the debt ceiling ‘debate’. The market does not show the same concern. I am speculating a rally and green close this upcoming week above 1700. 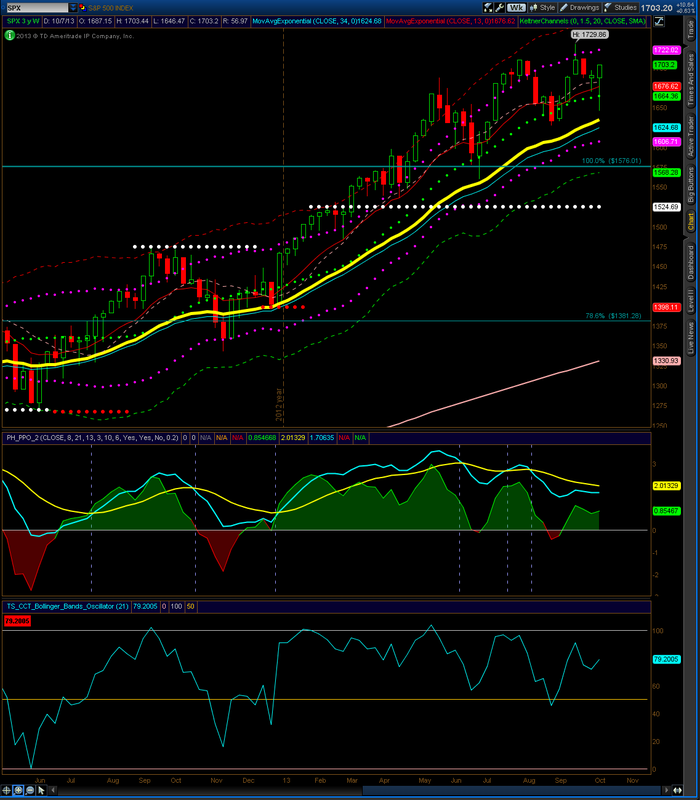 The S&P 500 monthly is showing another close above the top Keltner line. 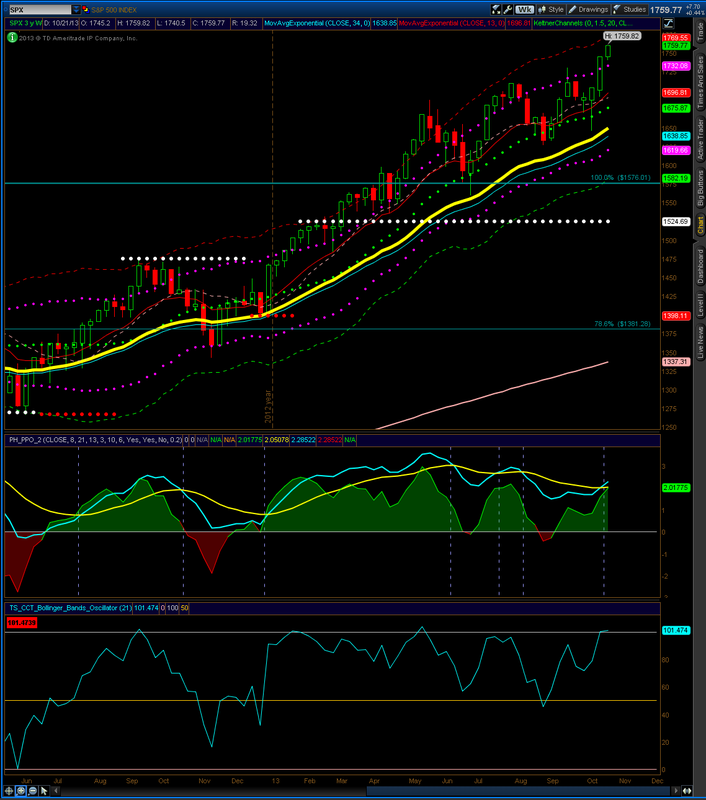 In the event of a rally, highs near 1728 could be retested, while a sell off could retest 1619. The monthly outlook is bullish.